Working as a therapist in a state psychiatric hospital, and as a school psychologist based in schools, as well as correctional settings, gave me many sad, humorous, and interesting memories. That history plus a love of crime, and thriller novels beginning at an early age with "Nancy Drew Mysteries", graduating to "Miss Marple Mysteries", and finally to "Crime and Punishment" led to my writing career. I was born and spent most of my life in vibrant Chicago which fostered my love of theater and art. I currently live in sunny Arizona with Darcy, a rescued Maltese, who guarantees that my day begins very early working on the second book in this series. Shocked Silent by Judith Driscoll is the perfect psychological thriller, making this a really good story from the very beginning until the last page. Susan is a social worker in a psychiatric hospital, helping as many people as she can; feeling their pain and trying to make each case end well. The man she loves is Dr. Mark Denning who is her boss and love interest, but he is not willing to commit to a lasting relationship. When Susan gives him an ultimatum and their romance ends, though Susan does not know it at the time, her life changes dramatically. Elliot Mason is a lawyer and the new man in Susan’s life. We learn early on that he is the bad guy and part of a drug crime group. All of this adds to twists, turns and thrilling moments. When Susan gets a new job and a new marriage, her life slowly starts to unravel until she finds herself knowing too much and being placed in a dangerous situation because of that knowledge. We get an up close and personal view of the horrors of a psychiatric ward in the late 1960s and what a few bad men can accomplish. Reading Shocked Silent had me reading whenever and wherever I could and late into the night. I felt as though I was right there with Susan and needed to be there to share in all of her joys, sadness, love, hate and life-threatening situations. Judith Driscoll has written a book offering great character studies, a spell-binding plot and a suspenseful conclusion that had me holding my breath and anxiously turning the pages of my kindle. If psychological thrillers are your kind of book, then Shocked Silent is a must-read. I really do believe that this would make a very exciting made for TV movie or even an ongoing series with a different case each week. I know I would certainly be a fan and watch it faithfully. Please do not pass up Shocked Silent. You will not be disappointed as it is a sure winner. Though it might not have been her primary motive in writing Shocked Silent, author Judith Driscoll addresses an important issue in the lives of many young women who think they have fallen in love with and marry “Mr. Right” when they don't really know enough about him. That’s what happens to the protagonist, Susan, in Shocked Silent. After she breaks up a two-year relationship with Dr. Mark Denning, Susan, a social worker, is charmed and wooed by a handsome, narcissistic lawyer, Elliott Mason. He rushes her into marriage, but not because he loves her so much. His motivations are both dark, dangerous and fuelled by greed. By the time Susan realizes this, it's too late. The author takes her time leading readers to the intense, suddenly rapid, heart-pounding race toward the climax, but along the way she treats us to some fascinating vignettes of what it's like to work with the mentally ill. It's certainly a challenging occupation and even life-threatening at times. But as Driscoll shares these vignettes, together with the characters, readers experience heartache, fear, anger and occasionally joy. Through Shocked Silent, Judith Driscoll offers an emotional and realistic look at people of all kinds. Don’t be surprised if you close the book hoping you never cross paths with some of them. 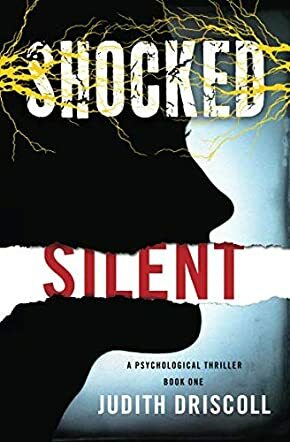 Shocked Silent: A Psychological Thriller by Judith Driscoll fulfills all the conditions required for a psychological thriller, exploring powerful themes and building on an existential conflict with strong emotional and psychological implications. It is 1968 in Chicago and there is a lot of controversy regarding state psychiatric hospitals. Susan is a psychiatric social worker who has just suffered a devastating breakup with Dr. Mark Denning and is vulnerable when Elliott Mason, a lawyer, comes into her life. Elliott is a charming and charismatic young man, but one with secrets, and Susan is unaware that the mob has plans for him, the same mob that sent him to law school. Now they want him to get a wife, one who will play a role in advancing his political career. As though working the psychiatric wards wasn’t enough to make her life horrible, Susan is learning, to her utter stupefaction, that the man she loves is intimately involved with crime. She is aware that she is being manipulated, but is there a way out? Can Elliott escape the complicated situation he finds himself in? Judith Driscoll is a great writer and her novel is rich in the different aspects of the narrative — the plot is unpredictable, gripping, and fast-paced, the characters are sophisticated and believable, and the setting reflects relevant political and social issues, brilliantly showcasing the game of power and corruption. What does it take to succeed in politics? This is the question that moves the plot, and we witness a conflict that is strong and how far a human being will go to achieve selfish goals. Themes of friendship, love, politics, corruption, and crime are deftly woven into the narrative. Shocked Silent: A Psychological Thriller gets your attention from the first page and keeps it until the very last. A perfect escape for fans of psychological thrillers. Shocked Silent: A Psychological Thriller by Judith Driscoll is a great story with elaborately developed characters and a strong conflict. A psychiatric social worker, Susan, has just broken up with Dr. Mark Denning when she meets the charming Elliott Mason, a lawyer with huge ambitions. Her feelings for Elliott grow quickly and she is in love to the point that she’ll do anything to protect him and see him succeed. But she doesn’t know that the man she loves is backed by someone in the mob, the same person who sent him to school. Susan has seen all sorts of suffering and inhumanity in the state psychiatric ward. Will she have the courage to break away when she learns the truth about Elliott or will she accept becoming a liability with resigned docility? I love characters that are faced with conflicting emotions, torn within when it comes to loyalties, and Judith Driscoll creates such characters. I enjoyed her portrait of the female protagonist and how she explores the depth of Susan's psyche and her emotional disposition. The reader feels as though they are looking into the heart of the character. Besides crafting characters that are rich and believable, the author uses prose that makes the story an enjoyable read, a work filled with beauty and elegance. The narrative has strong plot points — the structure is good and constructed to allow for character development in its progression, the pacing is fast, and the conflict escalates quickly to a crisis point. Shocked Silent: A Psychological Thriller is hard to put down. It grabs your attention from the onset and the grip never wavers. “This morning we broke in and got her chart, and it turned out that Susan is her therapist. Patients tell their therapist everything; it’s like going to confession.” Set in Chicago in the late 1960s, Shocked Silent by Judith Driscoll is a psychological thriller that follows main character Susan Carey, a social worker at a psychiatric hospital run by the state, and a community mental health center. When Susan sees that her relationship with Dr. Mark Denning is going nowhere fast, she ends it and attempts to rebuild her life and repair her heart. When a captivating lawyer and aspiring politician named Elliott Mason offers Susan everything she's dreamed of on a gold-rimmed platter, she unknowingly enters into a union with a man who has a deadly affiliation with the mob, and Susan now becomes a disposable pawn. Shocked Silent by Judith Driscoll offers an intriguing story that is wrapped up in a series of well developed backdrops. Driscoll has an impressively skilled hand in the sketching of settings and action sequences, bringing Chicago to life while, at the same time, staging scenes that are thoroughly depicted. A violent assault between Susan and Elliot as the story hits its climax is spine-tingling in the accuracy of its portrayal, prefaced beforehand with a collection of woven acts of violence – both physical and emotional – threading Elliot's gaslighting into the plot. There are some moments where the suspension of disbelief requires a firm commitment from the reader, but overall this book is a good and fast-paced story that can be gobbled up in a short space of time.